Great watch for LE use. Indiglo with a black and blue design. Nice and comfortable band. Only complaint is the second hand ticking is noticeably loud. Either way I’m happy. Dimensions 44 mm x 11.5 mm x 8.0 in. was pleasantly surprised by this watch. 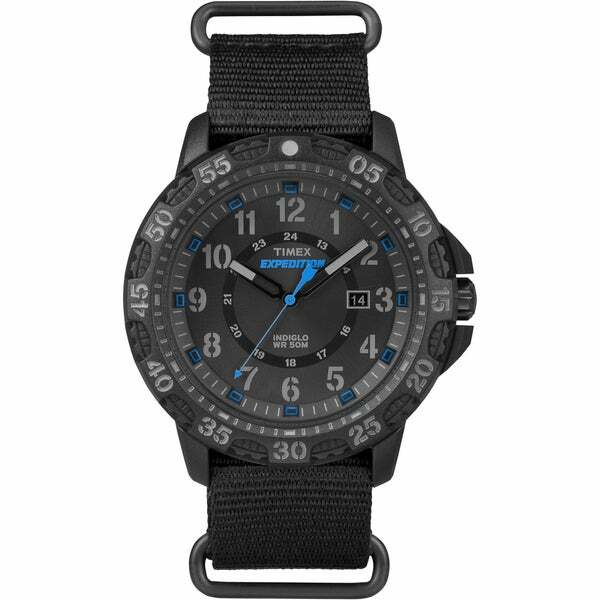 I have and wear high end watches and was looking for a watch I could wear while working outside or while doing astrophotography. Lights up nice and bright at night with the touch of a button. Strap is decent. Would buy again for this use. Iwas disappointed with the size of the date window on the watch face. The blue hands made them hard to see. I set the date correctly and with 30min it jumped two numbers. one number I could understand as my mistake but not two days. other than going thru a24hr cycle there were no instructions as to remedy this problem. sent back immediately. Bought a a birthday present for my son He likes it very much, wears it everyday. Excellent for the price.